Multi-locus sequence typing (MLST) has proven its usefulness for molecular typing of bacteria over the last 15 years. Classical MLST schemes typically define seven loci (housekeeping genes), which are sequenced using Sanger technology. Unique sequences for each locus are assigned allele numbers and bacterial strains are identified based on their allelic profiles, which is the combination of the seven allele numbers. In contrast to whole genome SNP analysis, wgMLST is based on the concept of allelic variation, meaning that recombinations and deletions or insertions of multiple positions are counted as single evolutionary events. This approach might be biologically more relevant than approaches that consider only point mutations. The major drawback of the technique is that it requires allele curation. In absence of suitable automated tools, it would be a daunting task to maintain a consistent allele assignment for thousands of loci. To accommodate for this, automated curation tools are provided. The wgMLST curator plugin offers a full range of automated curation tools needed to set up and maintain a wgMLST schema for any organism of choice. Whereas only a limited number of people will have access to the curated organism-specific reference database, most users will only need the WGS tools plugin. This plugin provides a fully automated pipeline for identifying alleles based on whole genome sequence data. In BioNumerics version 7.5 and higher, demanding calculations such as de novo assemblies can be performed on an external calculation engine. The choice here is offered between virtually setup-free pay-per-use cloud solutions (e.g. via Amazon) or a local deployment e.g. on a computer cluster (requires custom services). From within BioNumerics, jobs can be posted on the calculation engine and the results from such calculations retrieved (including parameters for quality control). 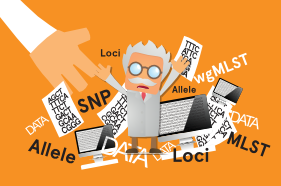 Only the wgMLST allelic profiles are stored in the BioNumerics database as character sets, resulting in a lightweight and responsive strain database. Based on the loci included in the wgMLST scheme, additional typing schemes can be defined on different levels, e.g. core genome MLST (cMLST), ribosomal MLST (rMLST), etc. The character views in BioNumerics version 7.5 and higher offer a flexible tool to select the set of loci used for typing, cluster analysis (e.g. minimum spanning trees) or statistical tests present in the software. Why use BioNumerics for your wgMLST applications? If you are working on one of these organisms or any other organism not present in this list, please do not hesitate to contact us for a possible collaboration on wgMLST analysis. wgMLST: the future of molecular typing! You want to try it out for yourself? You can! Just request a BioNumerics evaluation license and download the Brucella, Escherichia coli, Listeria monocytogenes, or Staphylococcus aureus wgMLST demonstration database from our sample data download page. These databases allows you to get a feeling for wgMLST analysis without the need for a wgMLST project or calculation engine credits. Several wgMLST tutorials are available to guide you through the process.